Ambassadors from The Chamber of Medford/Jackson County joined Rogue Community College and Fire District No. 3 to celebrate the grand opening of the RCC/FD3 Fire Science Center on Feb. 5, 2019. After five months of construction, Rogue Community College and Jackson County Fire District No. 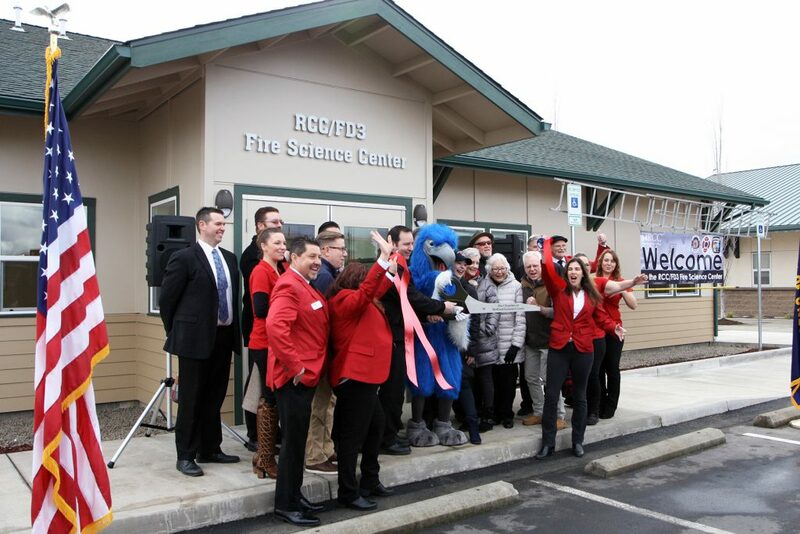 3 celebrated the grand opening of the RCC/FD3 Fire Science Center on Feb. 5, 2019. The $1 million joint project adds classroom and meeting space next to the FD3 administration building at 8383 Agate Road in White City. “We would like to thank the taxpayers of Josephine and Jackson counties for their support of this project. We are excited to take this next step in improving fire science training in the Rogue Valley,” said Gary Heigel, chair of the RCC Emergency Services department. The 2,600-square-foot center provides classroom and office space for the RCC Fire Science program and serves as a centralized location for affiliated fire and public safety organizations to host local and regional trainings. The center’s two classrooms can be combined into one large meeting space accommodating up to 150 people. The new building is located on the southeast corner of FD3’s White City Campus, which includes a training center used by RCC fire science students and professional firefighters. “We are excited that our partnership brings added capacity to the emergency services program and we look forward to educating public safety providers throughout the region. We are thankful for the community support of this project and the vision of the RCC Board of Education, and the Fire District 3 Budget Committee and Board of Directors to enhance the regional training center,” stated FD3 Division Chief Dave Blakely. This collaborative effort between RCC and FD3 was envisioned and discussed for many years before the breaking ground in August 2018. The new building is a $1 million dollar investment between both partners. RCC allocated $500,000 from Bond 17.69, passed by voters in 2016; the Fire District 3 Budget Committee and Board of Directors allocated $500,000 from the District’s Capital Project Fund. FD3 also donated the land where the building is located. To schedule a class, meeting or conference in this facility, contact FD3 at 541-831-2715.